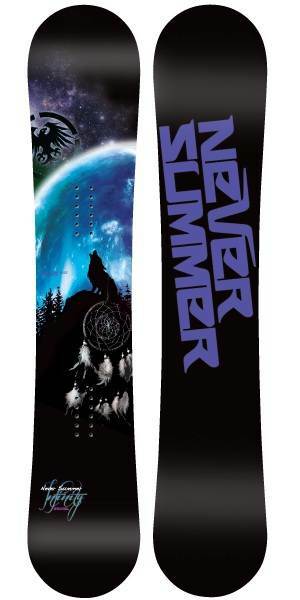 The Never Summer Infinity is a good choice for a women’s hybrid rocker all mountain board. We are a little more partial to the Raven these days but it’s still a good board for doing a little of everything. Not much has changed over the last few years. 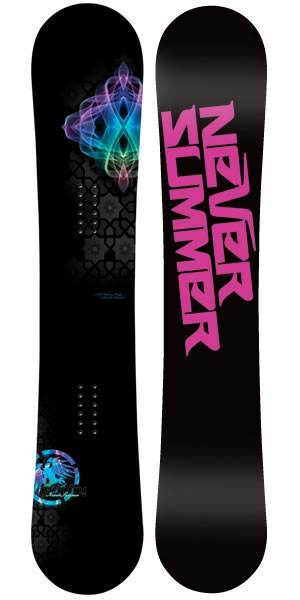 Other than a few minor tweaks, the 2019 Never Summer Infinity has remained pretty much the same as 2018 so the review still stands. Thanks Never Summer and P3 in Mammoth for letting us try it. We took the twinish set back Never Summer Infinity in powder, groomers, trees, the park and steeps. The Infinity handled everything well but nothing amazing either. On Snow Feel: So the Infinity feels pretty stable in softer snow but when it gets harder it can feel a little loose between the feet for one footing and flat basing. It kind of wants to auto spin on you in harder conditions and that can be a bit annoying but if you keep it on edge it will be ok. It’s very forgiving and offers a pretty fun all mountain, cruise the groomers, float really well in powder kind of ride. Despite the semi-stable ride between the feet, it has a pretty damp almost rubbery feel underfoot that is unique to never summer. Turn Initiation and Carving: Easy to turn but it still doesn’t feel totally effortless and most will like this. The one thing we noticed was the Infinity seemed to be a little washy when making a skidded turn but it’s pretty easy to do so. When throwing out a harder carve or wide radius turn it’s missing a little something that makes it great but the tip/tail don’t give out unless you really put some hard carving weight into the board. The Infinity turns better if you get your knees out more towards the tip and tail like you are more in a Gorilla stance. That way there is more pressure on the tip/tail, you engage the camber in the tip/tail and it turns a little better. If you ride more with your knees in like a surfer then it’s more washy and less fun in a turn. Powder: There are so few powder days in a season so it’s hard to get out on every board when it’s deep. We had many days with not much over a foot but finally had some deep days. 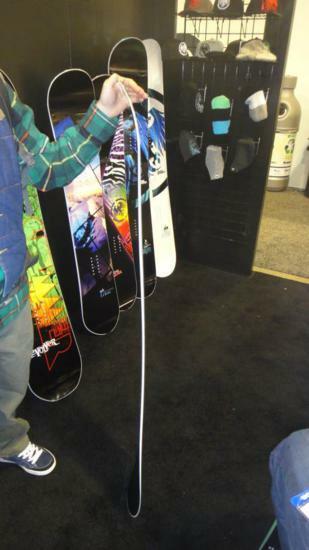 The float is very effortless and easy for a board of its shape and size. When setting the stance all the way back on board you can get 4″ of good directional float that will really relieve your back leg. It’s not a dedicated powder board but when set back all the way it’s got some good directional surfy float. It’s pretty quick and easy in trees and not bad on a wide open face. It’s pretty close to the Aura but we would say is just a bit better due to the mellower camber and a .25″ extra set back on board. This is more like a 3.75 out of 5 where the Aura is a true 3.5 out of 5. 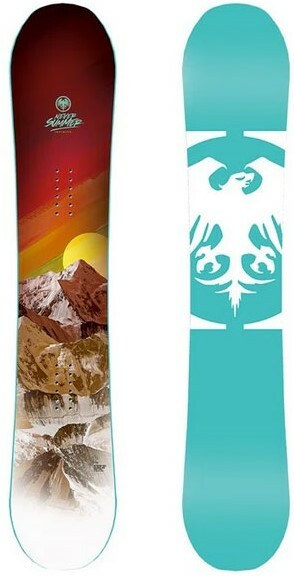 Speed: The tip/tail do bounce a bit but the board is pretty damp so it doesn’t feel like the tip tail is sending that chatter throughout the entire board. Never Summer isn’t bad when it comes to making a board that shouldn’t feel that good at speed feel better. Uneven Terrain: The Infinity can handle uneven end of the day snow very well. It’s got some kind of dampening system that is pretty good at speed but still mellow enough to handle slower bumpy end of the day snow. 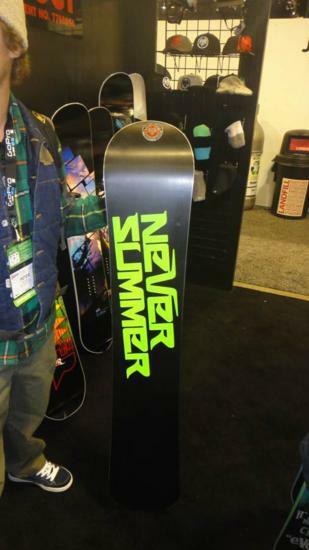 Approximate Weight– The Never Summer Infinity is on the heavy side of normal like all Never Summer boards. However, they are one of the only companies that have a 3-year warranty so it’s worth a little extra pressure on your leg when riding the chair. They are very well made. Edge Hold: The Infinity did hold an edge quite well without grabbing too much. It had the ability to hold an edge on hardpack days. It wouldn’t be ideal for the ice coast but will do well in most conditions sane people consider worth riding in. Flex: Right there in the middle flex wise but the rocker and camber profile offers a pretty easy ride to butter and press compared to some All Mountain boards. You can get the board to flex past the camber profile and that’s just fine. There is also a little return/spring out of the tip and tail that gives the board a more lively feel than continuous rocker. Jibbing– It runs a little longer and rides stiffer than a good jib board should but it is not completely unforgiving either. If you want to hit a box or bonk it should be fine but it’s no jib specialist. Switch: This is a twinish board but not a twin. The contact of the nose and tail is minimal and that helps the Infinity ride better switch than a cambered version. There is still a difference between regular and switch but you get used to it over time. Pipe: It has enough edge hold and speed to climb a big pipe but at the same time the hybrid rocker shape will help you land when you come back down. It’s a really fun ride here but it’s more aggressive riders might want a little more drive from wall to wall. For most, it will inspire confidence in the pipe despite it running a little larger than a dedicated pipe board. Jumps: It’s got a reasonably good pop for an ollie and when the stance is centered can land well switch. All in all, this is a good choice for anyone looking to get a do everything board and want’s something a little more twinish and mellow than the Raven. It does nothing really well but it does everything pretty good and that’s all you can ask for out of an all mountain board. We have ridden the 2010-2014 models. The newer the year it seems just a bit better flat basing on hard pack or one footing off the chair. Maybe we are getting use to hybrid rocker but it seems like things have changes. 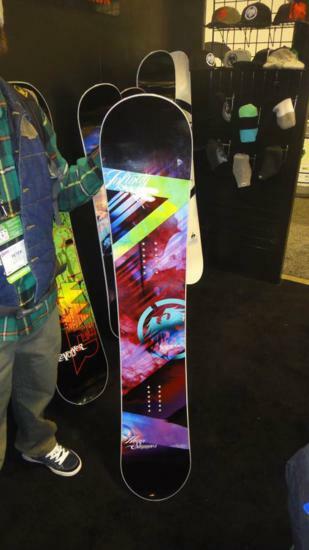 This is one of our favorite all mountain rocker snowboards. We try to get as many images of the Never Summer Infinity, but forgive us if they're not all there.